Misool island, like a little paradise with the beautiful beach and amazing sea park. Lied several coral islands in the western and eastern parts, Misool is one of the 4 largest island in Raja Empat islands. Misool directly bordered with Seram Sea and the high seas which become a main route of sea mammals such as whale, dolphin, and many more. You can enjoy the beauty of Misool island. These spreaded islands is mostly uninhabited. The beauty of underwater paradise in Misool has been already identified even before you swim and dive in the crystal clear waters surrounded by the white sand beach which lie along the coast and tropical rainforest as well as the green mangrove. These refreshing sceneries will clearly imprison everyone's heart in this paradise. As we know, Raja Ampat islands include in the world corals triangle where the underwater park save 75% of colourful fishes and coral reefs in the world. There're several dive spot which offer spectacular sceneries, explore the richest underwater paradise in the world. Several kind of fishes, coral reefs, sharks, turtles, stingray, and other marine biotas which inhabit the underwater paradise of Misool. Therefore, diving, snorkeling, swimming, sunbathing will give you an exclusive impression. Not only the wealth and its nature beauty, Misool island also has cultural diversity from their native society. Historical trails also can be found here in the cave walls. What You Can Do There ? Many activities you can do there. Snorkeling and diving are the main one and can't be canceled / delayed. Its clear crystal water will make you witness the beauty of underwater sceneries even from your own boat. The visibility can up to 25 meters from the surface. There're so many dive spots which save the amazing and beautiful sceneries in Misool. You may need much time to explore every dive spots there because you might be busy to explore only one dive spots include its underwater. The best diving seasons in Misool island can be enjoyed all year. However, you need to remember that the dive activities during rainy seasons might be a bit disturbing your activities. Your visit in a different time may make you get more experiences there. Boat trips is another joyful stuff that will take you to witness exoticism of the islands which nearly untouchable of damages and pollution. Scuba diving could be your optional water sport when you there. Moreover, swimming, sunbathing, or just sitting around the beach and spend your time could be another joyful activities. Accomodation to support these activitis could be found and rent in resorts around Misool island. There're several villages around Misool island which also can be visited. A visit to small villages with the low population will give you experiences and knowledges about local culture and its traditions. Exploring mangrove forest, witnessing birds and animals in the forest is another optional activity to fulfill your holiday. To get into Misool island, you can schedule your flight to Domine Eduard Osok Airport in Sorong. Then, to explore Misool island, you can choose to follow the tour using Phinisi boat. As archipelagic territory, the main transportation here is boat and of course, it's the main transportation to take you explore and walk around the Misool island and the small islands around. There're tour package where the boat besides as a transport vehicle but also become a rest place to explore another beauty of Misool island in another day. If you stay in resort such as Papua Diving Resort or Misool Eco Resort, they usually provide shuttle service using private speed boat from Sorong airport. There're several accommodations and quite complete facilities in Misool island, which is started from inns, homestay in local houses, and stay in super luxury resorts, which is owned by private who own management rights of an uninhabited island and looks private. The most prominent place as well as become the icon of Misool island is the presence of Misool Eco Resort. 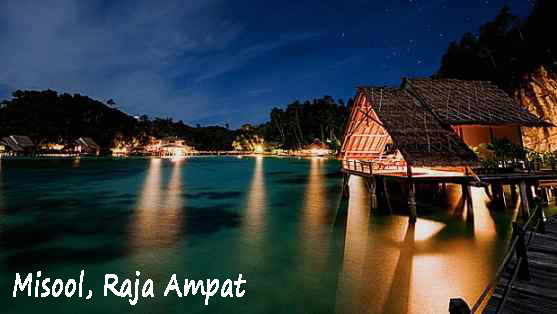 This place is one of some resorts who own business rights to manage the tourism in Raja Ampat. Not only manage ecotourism, but also manage conservation program with high commitment to protect the nature preservation and its utilization as ecotourism region. This resort is limiting the guest only up to 32 guests. Misool Eco Resort is managed and owned by Andrew Miners together his wife, Marit, and several staff consist of local residents as well as foreigners with high commitment to protect the nature preservation of Misool island, besides build supporting facilities and international class accommodation. Rumor says holiday to Raja Ampat is one of the most expensive tourism object because of its tariff and the price of goods and services there, is arguably higher than the prices in other region in Indonesia. Therefore, I recommend you to travel in group to save the cost and of course, more enjoyable. Rent the boat and inn needs high costs and it can be decreased by sharing the cost among your friends. The best diving season is occured nearly all the time. Only in rainy season may make your diving activity disturbed. 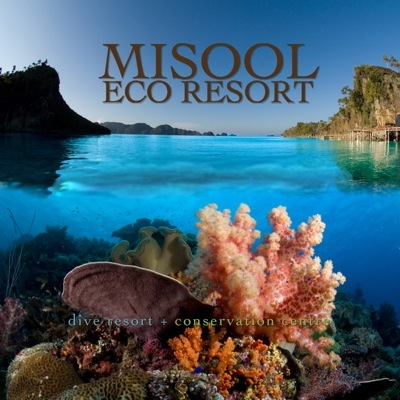 Misool Eco Resort is closed from tourism activity during the windy seasons from June to September. The beauty of Misool, which is aligned with the beauty of paradise is one of the most important biological wealth and also precious. Please participate to keep the preservation and its cleanliness by throw the garbage in an exact place or don't take any environmental destruction. Thanks for sharing. Explore https://www.ytechb.com/5-best-video-editing-software-pc/ Best Video Editing Software on YTECHB.